Convened by the Dellums Institute for Social Justice, the Our Beloved Community Action Network members are community, faith, and government leaders committed to the simple proposition that every person in Alameda County should have the opportunity to stay and thrive in the new prosperous Bay Area economy. Our ability to create the Beloved Community is severely undermined by the displacement and racial equity crisis. Ise Lyfe with Lyfe Productives, Margaretta Lin with the Dellums Institute, and Catherine Bracy with the TechEquity Collaborative on Prevent Displacement and Homelessness: Just Fund It! SOLUTIONS ARE AVAILABLE AND IT WILL TAKE a uniting of community Power and political will. Immediate solutions require keeping people housed through proven strategies of legal eviction defense and housing assistance funds for both low-income tenants and homeowners. It takes time and a lot of monies to build new affordable housing. Meanwhile, low-income, predominately people of color, are being forcibly displaced en masse. The cycles of displacement and the new homeless crisis will not be solved until we address structural barriers to housing for impacted groups including the formerly incarcerated, older adults, single headed households with children, and students. Fundamentally, we must change our value system of housing as a commodity to an inalienable human right. Neighborhoods like East Oakland that were devastated by decades of public and private disinvestment are now hot real estate markets for private speculators. At the same time, they remain redlined by public and nonprofit institutions. We must create new innovation to support community-led ownership of land and keeping place. 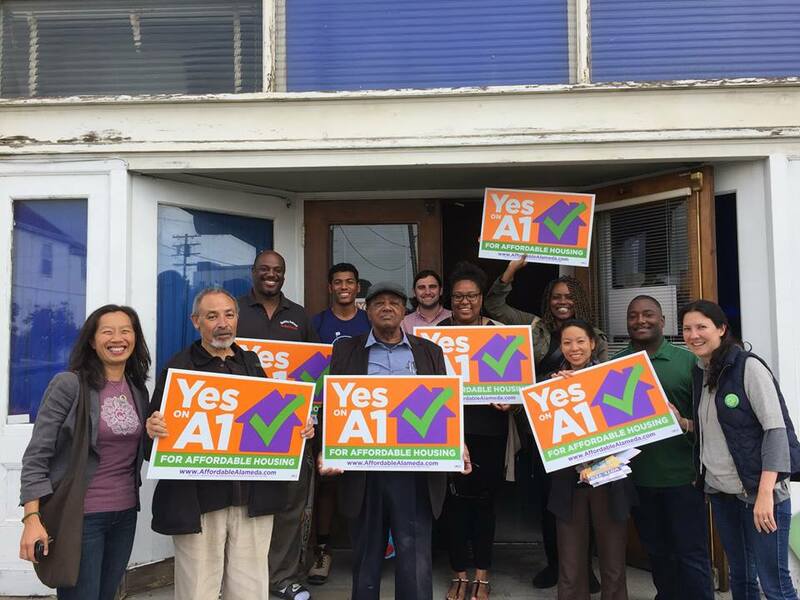 Operating 3 budget campaigns, we recently secured unprecedented new public funds in Alameda County, Oakland, and Berkeley: $65 million Anti-Displacement Safety Net. We trained 100 students to campaign for the infusion of new regional funds for affordable housing in Alameda County and crafted anti-displacement and racial wealth-stripping prevention policy strategies: $580 million Affordable Housing Development. We helped the Richmond Safe Return Project craft and secure the passage of a national best practice policy removing housing barriers for formerly incarcerated residents: Richmond Fair Chance Housing. We secured anti-displacement terms in the City of Oakland's new $100 million Housing Bond. We helped form the East Oakland Black Culture Zone Collaborative and developed the Business Plan for the Black Culture Zone Hub utilizing a collective ownership model. We provided policy technical assistance in the City of Oakland's fixes on its Rent Stabilization and Just Cause laws. Organize non-traditional allies to support the repeal of California's Costa Hawkins law, which is single-handedly responsible for many tenant evictions. Develop a Homeless Prevention Plan for Alameda County to stop the cycle of new homelessness and prevent more suffering. Operate campaigns to remove housing barriers for formerly incarcerated residents in Alameda County, Berkeley, and Oakland. Develop new initiatives on Older Adult Anti-Racial Wealth-Stripping to address the silent housing displacement epidemic. Innovate with the East Oakland Black Culture Zone Collaborative to create community-investment platforms for East Oakland residents to combat persistent redlining by public, private, and nonprofit development institutions. Create a comprehensive local Housing Justice Plan rooted in housing as a human right, building on our previous work on the Oakland Housing Equity Roadmap. Catherine Bracy from Tech Equity Collaborative at Oakland City Council advocating for an Anti-Displacement Safety Net. Martina Cucullu Lim from Centro Legal de la Raza Calls on Oakland City Council to fund universal legal eviction for low-income tenants. Justice legends Bobby Seale & Phil Hutchings join us for affordable housing bond!